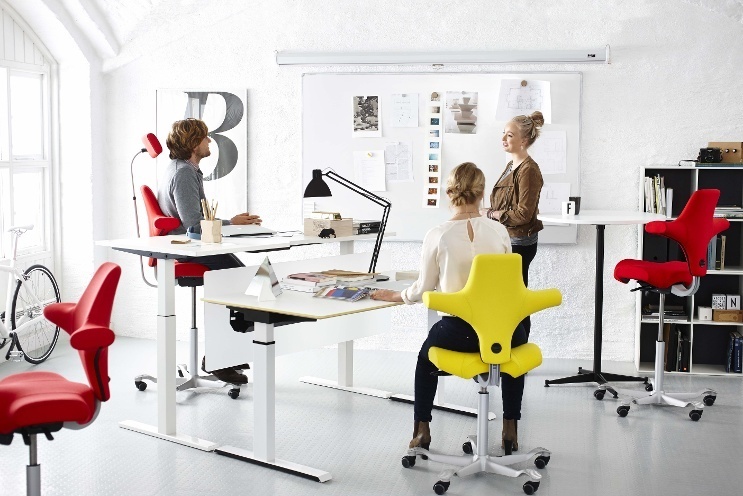 Workplace Wellbeing: To sit or to stand? To sit or to stand, that is a question on many people’s minds when it comes new office installations. 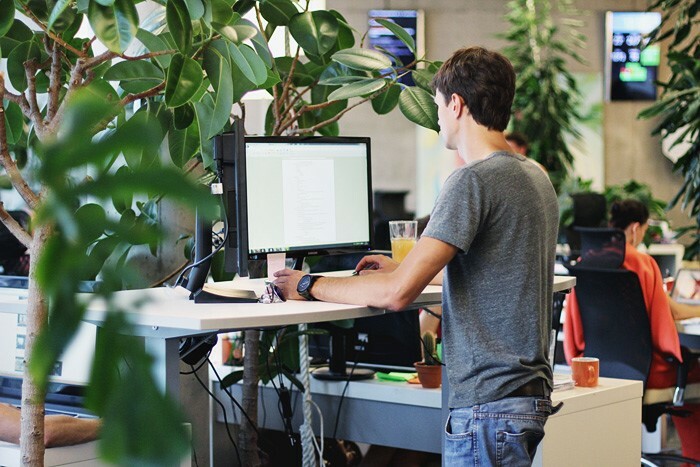 Almost daily, studies are published advocating the benefits of a stand desk, which are just as regularly rebutted by claims of the opposite. So what are we to believe? 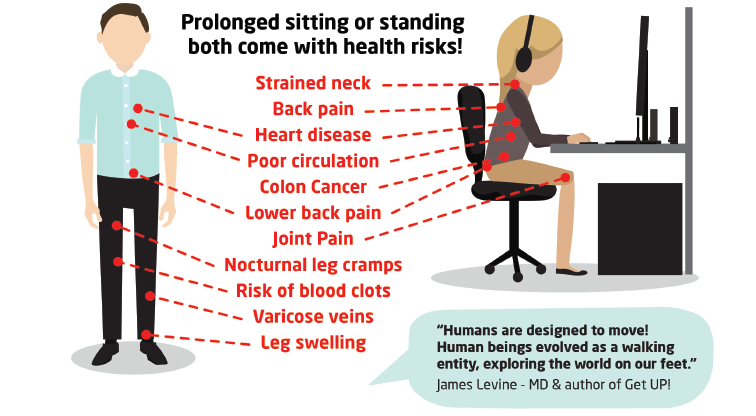 Before we look at standing, it’s important to recognise that sitting down all day long is not a healthy option. All the evidence from countless studies show that prolonged sitting seriously damages your health. In 2010 Circulation journal published a study of 9,000 Australians which found an 11% increased risk in mortality for each additional hour of television the person sat and watched per day. And perhaps most famous of all is the work of Dr Levine, who coined the phrase “sitting is the new smoking”. Initially attempting to discover why certain individuals were putting on more weight than others after consuming the same amount of calories (he assumed differing metabolism rates), he discovered that excessive sitting was a major factor in weight gain. Since that time he has regularly published studies exploring the subject, analysing various aspects of life when it comes to sedentary behaviour. So, sitting down for a long period of time is bad. There is no argument there. But is standing up any better? In fact the very first study which highlighted the dangers of sitting used standing as its direct comparison. 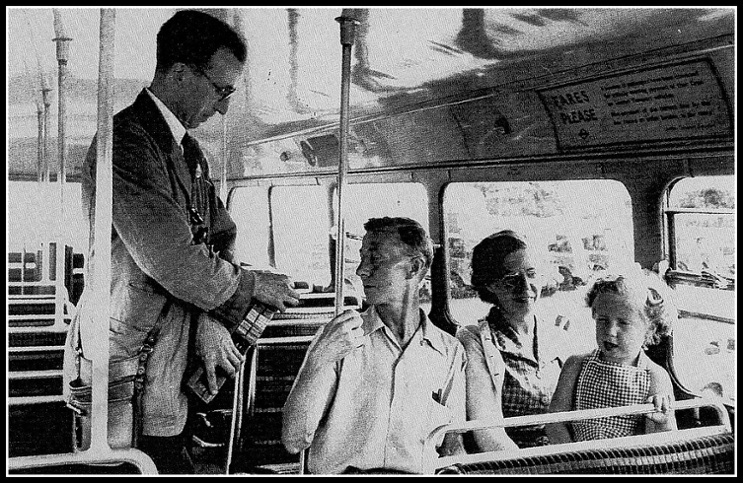 In 1953 the British Medical Journal was investigating why bus drivers were more likely to die from heart-disease than the conductor. Same job environment, same hours, except one sat all day and the other stood. They concluded it was the fact the driver was sat all day that was causing the health problems. Further studies compounded the issue. A London bus conductor doing his rounds, circa 1950. And in the workplace we have studies showing it increases productivity (by 50%! ), improves posture, and increases happiness. So if standing is better than sitting, why are there people who rail against the standing desk revolution? The answer is most often down to overzealous adopters of the new regime. 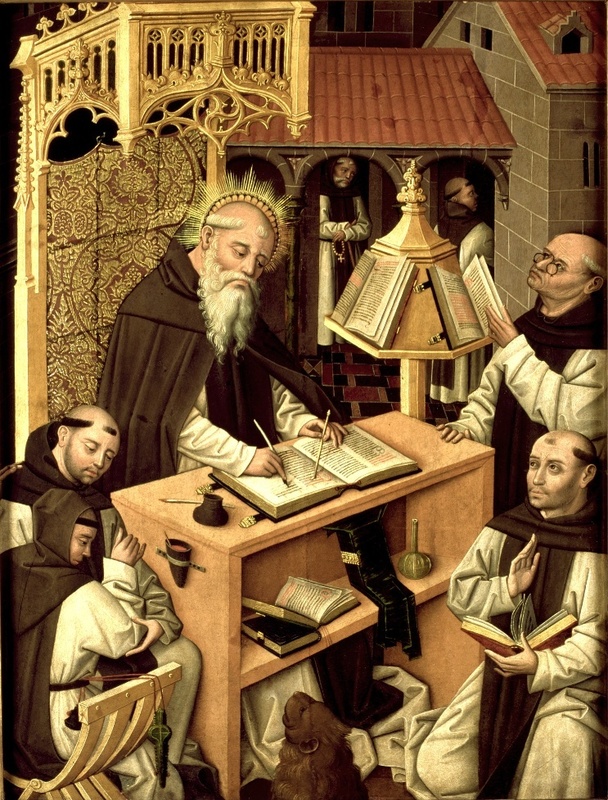 People who receive a new desk enthusiastically jump up, burn their chair, and denounce sitting as an eternal sin, but end up standing for the ENTIRE DAY. It is akin to joining a gym, and then immediately doing a session every day with 2 classes at the weekend. It is unsustainable and does more damage than good. Sit-stand desks offer the ability to sit or stand at a desk, encouraging versatility in working positions. A perfect example of this can be seen in an amusing blog by Mikael Cho, who had recently adopted a stand desk way of working. "Late one night, I finished building my standing desk. I assembled it from 22 dollars worth of ikea parts and after I drilled the final hole, I felt like a proud new dad. I was finally ready to start using a standing desk. I stood working for the first time — an hour and half with my bare feet planted on a yoga mat. I felt strong. Powerful. The next day I came in to the office ready for a day of standing. I stood solid for about an hour before my legs got tired. My back and shoulders started to cave in, but I fought. I squeezed my shoulder blades together, pushing against gravity — which now felt like a particularly powerful force. Even though I was fighting some pain, I thought it was good pain — like the pain you get when you’re building muscle when you workout. It felt like I was training my muscles for better posture and this was all part of the process. After about two hours, I took a break. Sitting felt like greatest invention ever." Standing all day isn’t the cure to sitting all day. Just ask a cashier, or an over worked nurse. In fact there are several well-known ailments caused by excessive standing. The trick is to build up your standing skills (much like weights at a gym). Biswas conducted a study with Finnish adults and concluded that adults should aim for 2 hours of standing a day at first, working it up to 4 hours per 8 hour day. Keep it in chunks too. 4 X 30 minutes chunks is manageable, and doesn’t put any unnecessary strain on your legs. The benefits of such behaviour simply cannot be overstated. 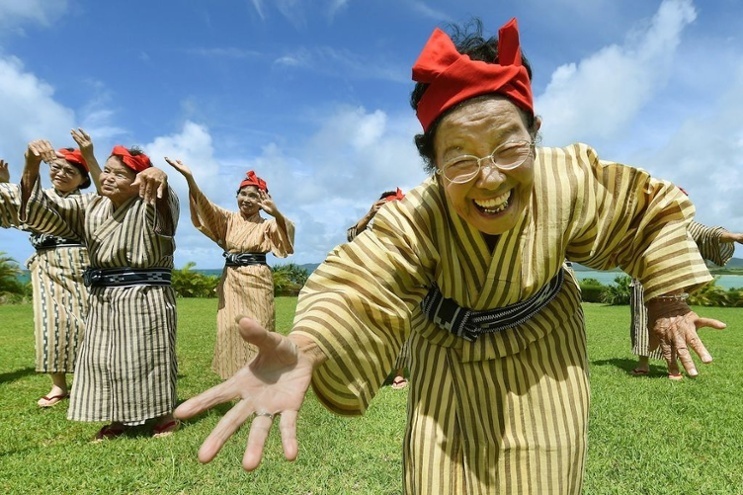 It’s no coincidence that residents of Okinawa generally live long and healthy lives. Using the floor more than chairs, they go from standing to sitting approximately 30 times a day, and locals have one of the longest life expectancies in the world. Changing position is much more important than the position itself. Dan Buettner regularly writes about the world’s ‘blue zones’, communities where people live the longest and healthiest lives on the planet. Significantly, they don’t exercise in the way we traditionally do. They aren’t all at the gym every day. Instead, they perform light physical activity on a regular basis, due to their lifestyles. They move. And they move a lot. The people of Kohama Island enjoy good health well into their older years. His conclusion is that walking is the only proven way to abate mental decline, and consistent low level activity is a core factor in leading a long healthy life. And that’s my conclusion too. Don’t sit at work all day long. Don’t stand at work all day long either. Regularly adapt your posture and position, and try to achieve as much low level activity as possible. Creating a working routine that can accommodate this whilst staying productive is a challenge, but it’s achievable, and the benefits you reap will be felt for the rest of your life.